People have been asked to "please stay off the moorland" as fire crews in Greater Manchester deal with a third "challenging" blaze. About 20 firefighters remain at a "significant" wildfire that broke out in Denshaw, Oldham on Saturday. Greater Manchester Fire and Rescue Service is still tackling huge fires on Winter Hill and near Saddleworth Moor. Assistant Chief Fire Officer Tony Hunter said the demands being placed on the service were "unprecedented". He said it was important that people stayed away from all three scenes, as "by walking on the moorlands close to where these incidents are, you are not only putting yourselves in danger but risk disrupting the work of our firefighters". "We want people to enjoy the sunshine but please find an alternative walking route," he said. "The support we have had from local communities has been overwhelming... but please help us deal with these challenging incidents by staying away." A spokesman for the fire service said about 50 firefighters were working "across four areas" on the moors near Stalybridge and four engines were supporting Lancashire Fire Service on Winter Hill. He added that two crews from West Yorkshire Fire Service, which has also been dealing with a moor fire near Bingley, were supporting work at Denshaw, as were volunteers from the local mountain rescue team and a helicopter from water firm United Utilities. 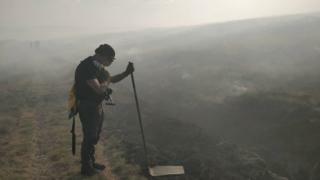 A Lancashire Fire Service spokesman said 10 of its crews remained on Winter Hill and were supported over the weekend by four from London and one from North Yorkshire. Following a tweet about the new blaze on Saturday, Greater Manchester Police also shared a picture of the aftermath of a fire in a cemetery in Uppermill, which lies between the Stalybridge and Denshaw fires. Two men arrested on suspicion of starting the Winter Hill blaze have been released under investigation. The fire near Saddleworth Moor fire is also being treated as arson by police.